Many people believe that buying gold derivatives are an easy way to buy gold. After all, you don’t need a lot of money to start with and you can make a quick profit if you do it right. However one can also make a terrible loss. Derivatives operate on the basis of not actually delivering a product or service. The very name tells you there is no product. A gold future is simply a deal to trade gold at a specific amount and price, decided now but with an agreed settlement day sometime in the future. That means you don't have to pay up front, except for a sort of deposit amount that stakes your claim as it were. And the seller doesn't need to deliver you any gold before that agreed upon date either. A gold futures contract is usually for three months and on the settlement day at the end of the contract the actual exchange takes place and the buyer pays up, and the seller delivers the gold. Now most futures traders use this delay to speculate. Both ways. The intention is to sell or buy back anything they have contracted, before settlement day is reached. At which point they only need to settle any gains and losses. This means they can trade in very large amounts. They take bigger risks of course but the rewards are much higher. Of course any losses are magnified also as they have to make good on them if they judge wrong. A gold option is a contract to buy gold or sell gold bullion at a future date at a set price. The delivery date, quantity and price are all predetermined and the option is simply that. An option. It involves a choice and the purchaser is not obligated to actually excise the option and buy (or sell) The similarity to the gold futures contract is that the price, date of settlement and the amount are all preset at the start of the contract. The main difference is that the option involves a choice whereby the futures contract is an obligation. 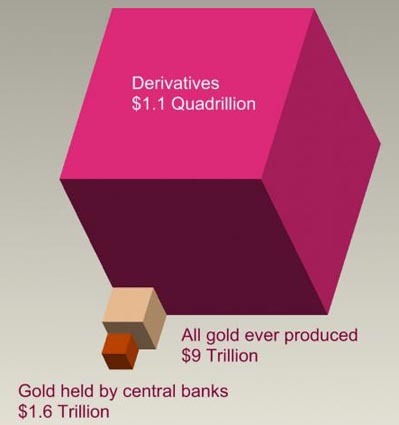 Because there is no gold backing either a gold futures contract or an option, and therefore no responsibility or ethics involved, gold derivatives have escalated to the ridiculous sum of at least $1.1 quadrillion world wide. This is far in excess of the total actual gold world wide and so such contracts are impossible to fill. People are buying and selling contracts for gold which they do not have. Similar to a long call type of option. Warrants however are issued by companies and usually as a private placement. That means most are privately held and not traded on the open market place. Warrants are usually traded and not exercised. Warrants are a very tiny part of the gold derivatives market. The bigger slice is help by gold futures. One could call gold derivatives fake gold. They are not based on gold, but use the concept or word even of gold to represent a paper trade. Gold is being used in name only. You could quite easily trade say, banana derivatives, or Bunsen Burner* derivatives and gleefully trade away 1.1 quadrillion Bunsen Burners and never see a banana or a Bunsen Burner in your life. Gold derivatives bear no relationship to gold at all. Eventually, like any house built of cards, this will come crashing down eventually and all hell will break lose. The winners out of all this will be those banks, commercial institutions and individuals who actually hold real gold. And the price of gold is going to sky rocket when the gold derivative house comes crashing to the ground. Hence the importance of buying gold now as no one can be quite sure when the gold derivatives crash will occur and the price of gold will escalate.